Sara Lauze, Vice President, Digital Banking Officer for New Hampshire Mutual Bancorp. Sara Lauze has been promoted to Vice President, Digital Banking Officer for New Hampshire Mutual Bancorp (NHMB). In this role, Lauze will be responsible for researching and developing emerging technology for digital services and channels. She will also continue her oversight of digital banking customer support, as well as related systems and services at Meredith Village Savings Bank (MVSB) and Merrimack County Savings Bank (the Merrimack). 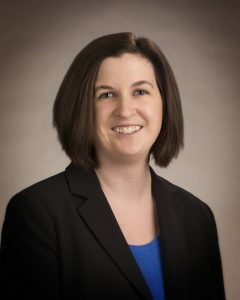 Lauze joined the Merrimack in 2005 as an ATM Deposit Services Assistant. She has held several positions throughout her career in operations and information technology, with specializations in deposit accounts and automated clearing house (ACH) services. In 2014, she was promoted to Operations Supervisor for NHMB, overseeing non-digital banking operations. She was promoted again in 2015 to Digital Banking Officer. Her most recent promotion to Assistant Vice President, Digital Banking Officer occurred in 2016. Lauze is a graduate of New Hampshire Technical Institute, the Northern New England School of Banking, and the New England School for Financial Studies. She also earned her Certified Associate in Project Management (CAPM) certification in 2012 from the Project Management Institute. Lauze currently serves on the Board for Granite State Independent Living, and resides in Concord, NH with her family.